Now available as a low-priced kindle exclusive. Private Detective Harry McGlade is hired by an Amish woman who suspects her husband is cheating on her. Going undercover into their community, Harry must untangle a web of lies and deception to find the truth. This will be his biggest challenge yet. Because Harry McGlade is an idiot. Lead Harry through a series of comic misadventures and bad puns as he traverses the J.A. Konrath universe, popping into many familiar books and stories. 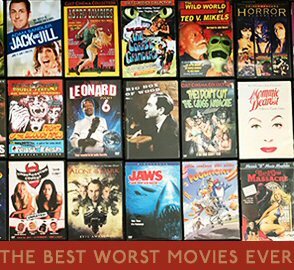 Prepare to be shocked and amazed by scenes that are just plain wrong. It's over 60,000 words of Harry McGlade, which is probably way too much. Banana Hammock is not a single, linear book, and should not be read sequentially, page by page. Instead, it is an interactive text adventure. This ebook is meant to be read out of order, depending on the path you, the reader, choose. Harry McGlade is a continuing character in the Jacqueline “Jack” Daniels series. At the end of each section, you decide where Harry goes, and what he does. By following different paths, you can arrive at many different endings. There are literally hundreds of variations. You control the character. You control the fun. Join Harry and a cast pulled from JA Konrath and Jack Kilborn stories, and push ebook technology to the boundaries of reading enjoyment, or something like that. This ebook is filled with raunchy humor, and has something to offend everyone. If you believe there are taboo things that shouldn’t be laughed at or made fun of, don't buy it. Instead, pick up one of my other, less-offensive books. But if you like roasting sacred cows, read on. You’ll laugh. I turned back to Facebook and continued playing Combville—a game where you used a virtual comb to comb a virtual head of hair, over and over and over again until time and life lost all meaning and you questioned the reason for your birth. “You don’t think that’s odd?” I asked. JA Konrath is the author of seven novels in the Lt. Jacqueline "Jack" Daniels thriller series. The latest is SHAKEN, published by AmazonEncore. He also wrote the horror novels AFRAID, TRAPPED, and ENDURANCE under the name Jack Kilborn, and the sci-fi novel TIMECASTER under the name Joe Kimball. Konrath has a lot of names, apparently. His newest is DRACULAS, written with Blake Crouch, F. Paul Wilson, and Jeff Strand. 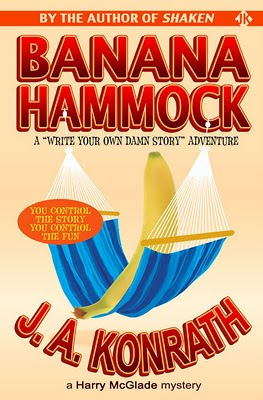 BANANA HAMMOCK is his attempt to recapture the fun he had as a child reading those books where you decide what the characters do. But this ebook is definitely NOT for children. Actually, it's not for anyone who has a shred of decency.